Summer is winding down, and your skin may be left dry and sensitive from all those days spent out in the sun. Some skin experts, like New York City-based facialist Joanna Vargas, are incorporating them into treatments to help repair the damage caused by the sun and pollution. And even if your budget doesn’t call for a spa day, you can still enjoy these benefits at home. Dr. Stafford Broumand, associate clinical professor of plastic surgery at New York's Mount Sinai Medical Center, highly recommends pumpkin for your best skin ever. 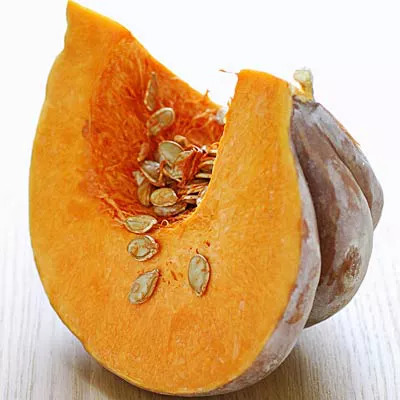 “Pumpkin has a high content of vitamin A and retinol is a derivative of vitamin A,” says Broumand. “Using this ingredient in its natural form delivers great benefits, such as exfoliation, repairing sun damage, post pigmentation, as well as improving texture and tone.” Create a face mask with pureed pumpkin, organic honey, a hint of lemon juice, and vitamin E oil for soothing results. This root vegetable, which is at its most tender until October, features fiber, keeping you feeling fuller, longer. They may also be the secret to getting your glow on this fall. “Beets reverse dull skin by stimulating the lymphatic system, removing waste from our cells,” says Dr. Jayson Calton. “Beets can also brighten your skin because they increase the oxygen-carrying ability in the blood, adding brightness to the skin.” Calton recommends savoring beet juice or a roasted beet salad this season. Forget the canned versions. The tangy berry is best savored alone, especially if you’re looking to give your dull skin a much-needed boost. “I like cranberry for its antioxidant and anti-inflammatory benefits. Plus, they are rich in nutrients,” says Dr. Elizabeth Tanzi, co-director of the Washington Institute of Dermatologic Laser Surgery. If snacking on bitter berries aren’t your thing, consider looking for skincare products that feature cranberry. This fruit will improve your skin smoothness, elasticity, and overall look,” says health coach Lori Shemek. “Pomegranates can also help reduce acne, sun damage, and fine lines with its powerful antioxidants, which also reduces skin inflammation.” Add them to nearly any dish for an flavorful meal. “Apples contain many bioactive compounds, which have antioxidant and anti-inflammatory properties,” explains Tzu. “Studies have even demonstrated anti-cancer properties of apples, including those of the skin.” Go apple picking this autumn for a fun workout and enjoy the fruits of your labor all season long. "Brussels sprouts contain high levels of collagen boosting vitamin C,” says Shemek. “Eating this cruciferous veggie can not only give you skin that has better elasticity, but skin that feels younger and more youthful looking.” If the idea of eating these mini greens makes you uneasy, take note that the way you prepare them determines how tasty they will be. “Plum mixed with yogurt and honey in a mask will improve elasticity and correct any sun damage that we’ve suffered from summer,” Vargas says.